1 Stampeding elephants are an unforgettable sight. The ground shakes. The dust rises. Spectators get out of the way...except if the stampeding elephants have riders on them, and they are chasing a small ball across a field. Then, the fans cheer. 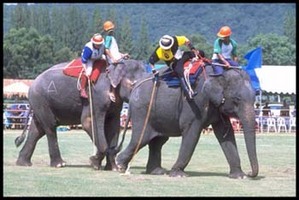 Elephant polo is a wild and wacky sport. The persistent, playful pachyderms seem to enjoy their games as much as the human polo players. 2 Making a wild animal into an athlete is not easy. Elephants are the largest land mammals on earth, so training them requires special skill. First of all, trainers have to be sure that the elephant knows that the trainer is in charge. Only then can the elephant be taught any tricks. Training an elephant requires lots of patience, even if you are teaching them a game. A trainer also has to be quick on his feet. He certainly would not want to get under a lumbering elephant foot by mistake. 3 Even though it is hard work, people have been training elephants for over 4,000 years. Ancient paintings and statues in the Hindu valley show elephants being trained for work and sports. Wealthy rulers kept elephants for war. For example, Hannibal used war elephants against the Romans. The Greeks and Romans also used elephants in circuses in arenas for entertainment. Later, elephants were used as beasts of burden for logging, which later became illegal in Asia. Elephant polo gave elephants a new purpose. It first started around the turn of the 20th century in India. The Maharaja's brave harem played this unusual sport when they felt bored. It provides fun for these intelligent creatures and the fans who watch it. This sport is popular in Nepal, Sri Lanka, India, and Thailand.